A new action park has been inaugurated in Haifa recently. The X-Park is the largest, most professional challenge park in Israel. X- Park is a new and unique concept of free time activities that offers a great variety of challenging activities, based on high quality educational values for the individual and for groups at all ages. 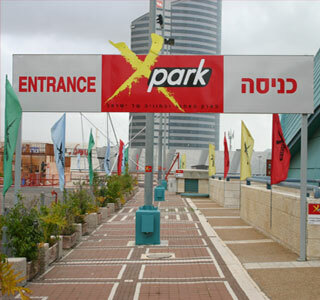 X-Park was planned and constructed according to the highest standards while maintaining the principle of establishing a unique activity center the first of its kind in Israel. It includes a wide variety of facilities designed to challenge every age and level of ability. X-Park is located in a perfectly suited topographical area in order to allow the individual and the group to enjoy a unique and unforgettable experience. The complex includes activity areas appropriate for every user from the age of five. A climbing wall - a unique, Olympic climbing wall, the first of its kind in Israel including indoor climbing areas. A Rope Bridge Park - includes 8 different rope bridges at a height of 7 m. As well as lower bridges for younger children. Giant Omega – allowing an 80m length rappelling down from the height of 30 feet. Paintball Complex - A virtual battle experience using paint balls. An arena of approximately 2acres that is divided into a virtual battle field, obstacle course and firing range for children. Skate Park Complex - the largest arena in Israel for skateboard enthusiasts, rollerblades and BMX bicycle riders. In other words, the park is a factory of your next boutique event!!!!
" בירת האקסטרים של ישראל "